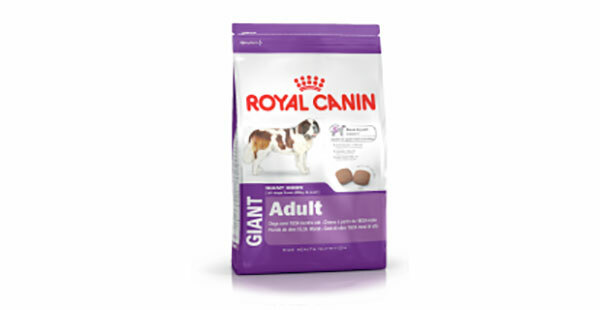 Complete feed for adult giant breed dogs (> 45 kg), over 18/24 months old. Royal Canin Outdoor 30 is ideal for adult cats with a very active lifestyle. It provides an optimal calorie supply for high energy expenditure and strengthens the natural defences, while maintaining joint health. Balanced and complete feed for adult cats (from 1 to 7 years old) with frequent access to the outdoors and regular activity. Royal Canin Exigent Protein Preference is specially formulated for fussy eaters. It helps maintain both the cat’s ideal weight and its vitality, and satisfies the appetite of even the fussiest of cats. For fussy adult cats over 1 year. After neutering, the risk of excess weight gain is increased 3 times, as the cat tends to eat more while its energy requirements actually decrease. Royal Canin Sterilised Appetite Control is a balanced and complete feed specially for neutered cats (from 1 to 7 years old) with a tendency to beg for food. 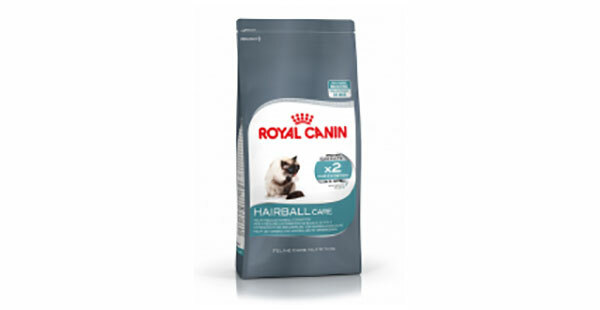 Royal Canin Hairball is specially formulated for cats with hairball issues. It nourishes the hair and greatly enhances the evacuation of swallowed hair, while guaranteeing strengthened digestive security. Recommended to help reduce hairball formation. 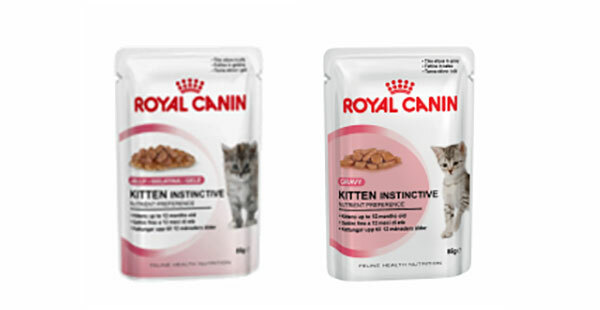 Royal Canin Kitten Wet Pouches are small tender chunks for second age kittens that have been formulated to fulfill their nutritional needs at such a key life stage. Natural Defence - helps to build the kitten's natural defences thanks to mannan-oligo-saccharides and an antioxidant complex (Vitamins E and C, Taurine and Lutein). Suitable for kittens ages 4-12 months (also suitable for pregnant queens). Varieties: In Gravy or Jelly. 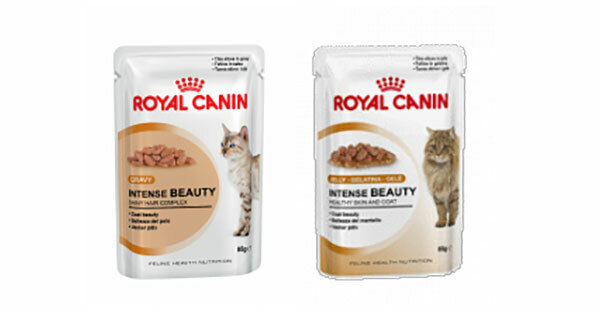 This Royal Canin Intense Beauty in gravy or in jelly is a complete and balanced diet for your adult cat over 1 years old. The tasty thin slices in gravy/jelly formula provides additional nutrients that help support your furry felines healthy skin and coat leaving them looking in great condition at all times! The feed provides a good supply of omega 3 and 6 fatty acids which also help support their healthy skin and coat. Royal Canin Kitten 36 is formulated to promote optimum development in a 2nd age kitten. The kibble is ideally suited to the kitten’s final dentition, and promotes optimal digestive security and tooth and mouth hygiene while boosting the kitten’s natural defences. Royal Canin Outdoor 7+ is ideal for adult cats with a very active lifestyle. It provides an optimal calorie supply for high energy expenditure and strengthens the natural defences, while maintaining joint health. Balanced and complete feed for mature cats over 7 years old with frequent access to the outdoors and regular activity. Royal Canin Exigent Aromatic Attraction is specially formulated for fussy eaters. It helps maintain both the cat’s ideal weight and its vitality, and satisfies the appetite of even the fussiest of cats. 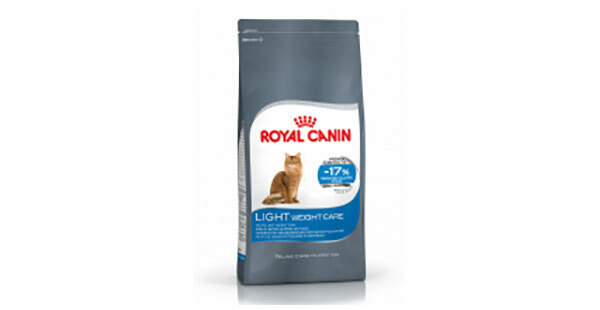 Royal Canin Light is ideal for cats with weight control problems. It provides the normal volume of food for your cat while decreasing the energy supply, mobilises fat reserves and maintains muscle mass, while also maintaining the cat’s appetite. Recommended to help limit weight gain. 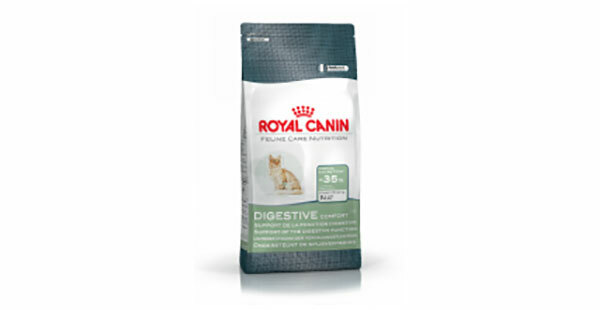 Royal Canin Digestive has been formulated to help manage digestive issues and help reduce the risk of regurgitation. The double action of special kibbles designed to encourage chewing and a highly digestible formula including four different fibres helps to aid digestion and regulate intestinal transit. Cats fed on Digestive Comfort should see a 35% reduction in stool quantity after just 14 days exclusive use. Supportive of the digestive function. 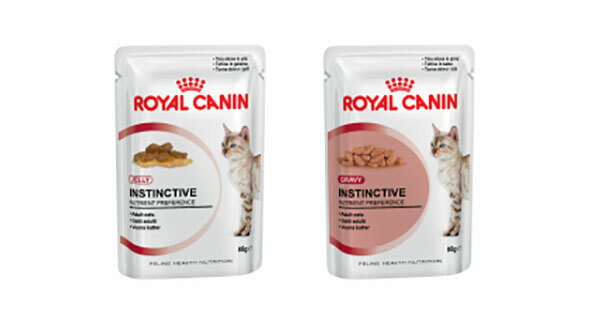 Royal Canin Instinctive Cat Food Pouches has been perfectly formulated to match the optimal Macro Nutrient Profile instinctively preferred by adult cats. Ideal Weight - especially developed for exceptional palatability while providing a moderate energy intake. Suitable for adult cats over 1 year old. 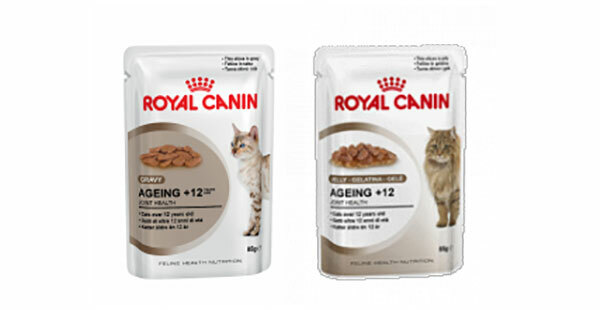 This delicious Royal Canin Ageing Cat is a complete wet feed for cats over 12 years old. The tasty complementary food helps maintain your furry felines healthy joints thanks to a high level of fatty acids (EPA/DHA). A nutritional profile is instinctively preferred. Royal Canin Fit 32 is ideal for adult cats with a moderately active lifestyle. It provides an optimal calorie supply and strengthens the natural defences, while helping to limit hairball formation and aiding the elimination of swallowed hair. Royal Canin Exigent Savour Sensation is specially formulated for fussy eaters. It helps maintain both the cat’s ideal weight and its vitality, and satisfies the appetite of even the fussiest of cats. Royal Canin Sensible 33 guarantees maximum digestive security for your cat, promotes a balanced intestinal flora, and will satisfy the dietary needs of even the fussiest of cats. For cats with digestive sensitivity. Royal Canin Hair & Skin is tailor-made for cats with sensitive skin. It helps to neutralise free radicals and maintain a soft, glossy coat, while promoting the skin’s role as a barrier. Royal Canin Oral is specially formulated to assist with a cat’s oral hygiene. It helps reduce the development of dental plaque and the risk of vomiting, while promoting smooth intestinal transit and the elimination of hairballs. Recommended to help reduce the formation of dental plaque and tartar build-up. 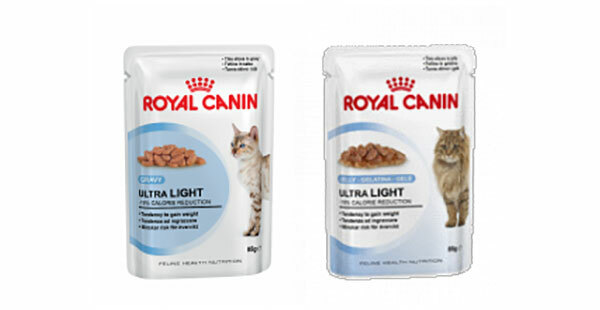 This Royal Canin Ultra Light Wet Pouches is a complete and balanced diet feed for your adult cat over the age of 1 year. The food is perfect for your furry feline who is at risk of weight gain as the formula used in the feed is low in calories. The thin slice in jelly or gravy formula helps to maintain palatability and meal size which helps your cat feel satisfied once they have eaten. The high protein content food also maintains muscle mass and supports a healthy urinary system in your cat.